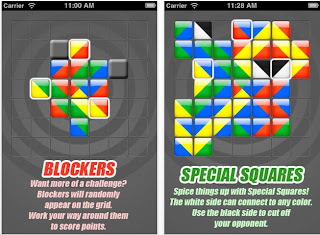 SquareA is a point scoring puzzle app from Smileypop. You are given 3 tiles at a time and must place them in the grid to match tiles already on the board. All tiles have just 2 colors. Except for the center tile which has 4 tiles. The game starts with that tile. In terms of scoring, if you can get a large area to match, it creates a large scoring combination. I've played SquareA about 5 times. I have not analyzed the game completely. For example, I'm still unsure about the scoring rules. 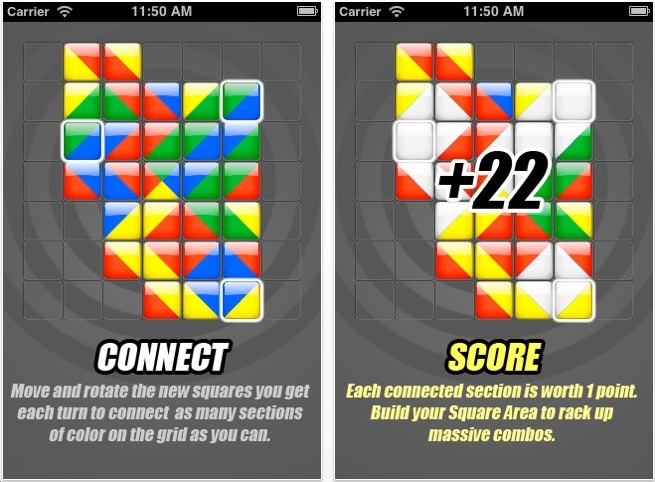 Also, I'm not sure if there is an equal distribution of colored tile combinations. SquareA is a free puzzle app. Give it a shot!